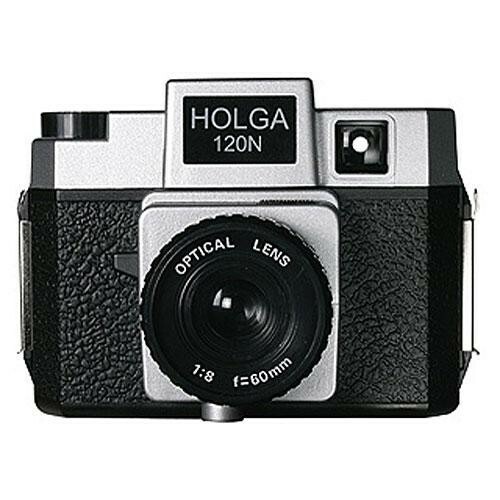 The Holga 184-120 Holgawood Medium Format 120N Camera with Built-in Lens (Twilight Zone) is desired by art photographers the world over and is reminiscent of the Diana camera of the 1960s and 70s. The characteristic vignetting focuses the viewer's eye and adds to visual impact. The standard features from the Holga 120S still include: Hot shoe flash sync, uses 120 roll film for 16 - 6cm x 4.5cm frames per roll. It's perfect for classroom instruction, personal image-making and fine art photos. Film Type Accepts 120 film, does not accept 220. Box Dimensions (LxWxH) 7.1 x 5.3 x 4.8"
184-120 Holgawood 120N Medium Format Camera (Twilight Zone) is rated 4.8 out of 5 by 8. Rated 5 out of 5 by e2verne from I love these cameras I have been a professional photographer and a hobby photographer. The Holgas help with both. I love the fact that they use film - chalk me up to old fashioned but I love the smell of developer in the morning. I can relax and just concentrate on the image - no worries about exposure, no double checking speed, no white balance, no all the stuff that gets in the way of creating images. Rated 4 out of 5 by Tim from Simple Great camera to just get back to the basics' It was great to not worry about white balance, software to fix my image and just let the film speak for itself. it brings everyone down to the same level and helps you focus on composition rather then your gear. Rated 5 out of 5 by Anonymous from These are truly fun tools! Using this is easy, gives great photos with the light leaks, plastic lens. It can take some experimenting but you will enjoy the photos you end up with. They make you work sometimes but that is all the fun. Great for art photography. Rated 5 out of 5 by pipian from Fun! THe Hoga was just plain fun to shoot with. Once you experiemnt with light leaks and shooting conditions you cna produce fun images. Rated 5 out of 5 by Anonymous from Great Old School Camera Here is a great medium format with a very recognizable image quality. Use: Solid artistic subjects. Pros: Easy to use, good sharpness and reasonably well built for the price. Cons: Requires standard film developing. Rated 5 out of 5 by Leah the Traveler from Love it. I love this camera and have loved it ever since my intro to photography class in college. The easiness of its controls and the picture that it produces are well worth the price and interest. Rated 5 out of 5 by lomolestamos from I would buy this product again and again its a great camera!! !